This machine is used to blend the powders in dry form. Different dry powders in measured quantity are poured to the dry mixing chamber thru a funnel. A ribbon type blade is mounted on a shaft. It is driven by a gear box and motor. 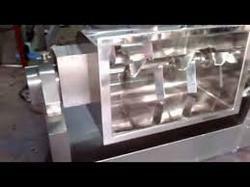 the mixing system have reverse and forward rotation of the blade, makes the homogenous dry mix. This machine can use for dry powder mixing, washing powder mixing, detergent powder mixing, food masala mixing, flour mixing. 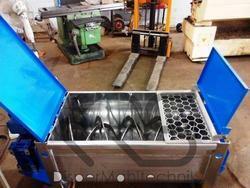 With vast industrial experience, we are involved in offering a wide range of Powder Mixing Machine. Double Cone Blender is used for mixing two or more different powders into the homogeneous mixtures. The Gear Box is made up of high tensile steel hardened to ensure long life work smoothly and noiselessly even in heavy load. We ensure a homogenous blending. We are engaged in offering a quality approved range of Ribbon Blender Mixer to our clients. The Double Cone Blender is an efficient and versatile machine for mixing dry powder and granules homogeneously. All the contact parts made out of stainless steel of required grade by customer. Two third of the volume of the Cone Blender is filled to ensure proper mixing.